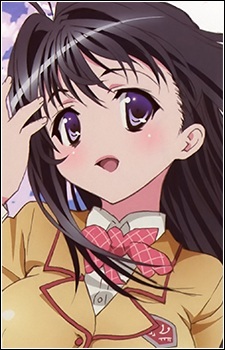 Chizuru is a second year female student at Kouta's school. She appears to be a normal, albeit big-breasted girl, but is in fact a 400-year-old powerful fox deity (when she reveals herself, her hair goes from black to blond). She is constantly hanging around and on Kouta, though he is the only male she acts genuinely towards. She loves Kouta very much and wants to enter a "relationship of sin" with Kouta. In the manga, it's quickly revealed that Chizuru and the others are living in a correctional facility for Youkai. And while Chizuru is trying her best to consummate her relationship with Kouta (for still somewhat ambigious reasons), though not without a fair share of problems to overcome. In the anime, Chizuru basically does little else than trying to force herself on Kouta, almost regardless of where they are and what Kouta feels about this, and then throwing tantrum fits whenever someone else makes a beeline for him.